The future has caught up with William Gibson. The science-fiction writer most famous for helping shape the public’s conception of the Internet has spent the last few years focusing his attentions on the endlessly shifting realities of the present. In 2003’s Pattern Recognition, Gibson examined corporate culture and the way logos and disposable information can lead observers down unexpected paths. Spook Country, from 2007, examined some of these same themes, as well as the concept of “locative art,” which exists at the intersection between reality and computer simulation. In Gibson’s new novel, Zero History, he brings back some familiar faces, and delves into a burgeoning cultural obsession with clothes that are somehow realer than real. The A.V. Club recently spoke with Gibson about his new book, how his creative methods sometimes require a change in perspective, and whether the concept of “science fiction” is still relevant in today’s multifaceted online universe. The A.V. Club: Zero History can be seen as the third part in a loose trilogy that started with Pattern Recognition and Spook Country. Was this intentional? 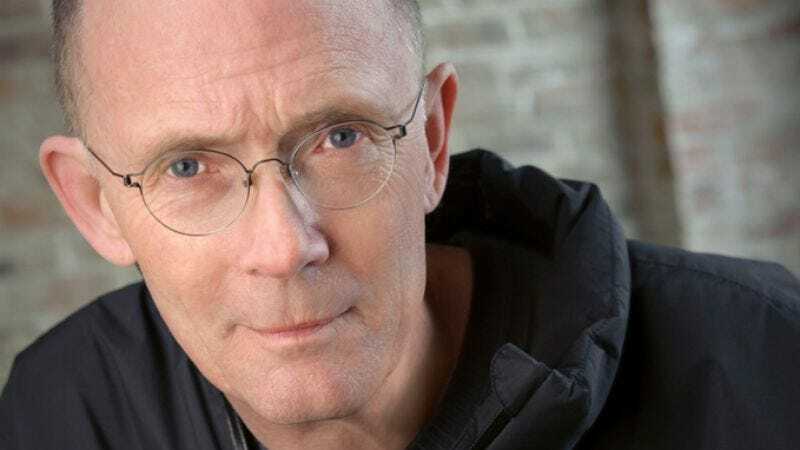 William Gibson: Well, I’ve never planned one of these sets of three books, and I don’t really think of them as trilogies, because I have this prejudice that trilogies are long, three-volume novels. It’s a more organic process with me, and every time I get to the end of one and start another one, I wonder whether the book I’m starting will be a standalone all by itself, or other books will grow out of it. I know that doesn’t sound very convincing, but it’s actually true. AVC: You often return to the same characters in your work. Do you like the sense of a pervasive world? WG: Part of the core of my system, such as it is one, is a way of trying to give the characters more control. If I’m practicing making up what the characters will do, it’s never good. In fact, when I catch myself doing that, I try to get rid of that section, and try and let them start making the decisions. One of the downsides of that method is that I never know who’s going to turn up in another narrative demanding my time. It surprises me. Some of these characters come with little galaxies of sub-characters, and that accounts for some of it. But otherwise, it’s just the weirdness of my method, such as I have one. AVC: So you basically just throw characters into the mix and stir. WG: Yeah, I like to get them wound up and drop them into whatever the setting is, and see where they go. Or see what they seem to attract. AVC: Have you ever written yourself into a corner that way? WG: Oh yeah, frequently. I often come to places where it appears that it’s not going anywhere, although often, the remedy for that is to turn the binoculars around and look at the entire manuscript from a great distance. And when I do that, I find that what is apparently a blind alley is actually an opportunity for something else. I don’t generate a storyline and then fill it out in the course of writing. The story actually generates in the course of the writing. It’s one of the reasons I’ve never been comfortable doing screenplays, because in order to get the contract for the screenplay, you have to sit down and tell them what’s going to happen. And knowing what’s going to happen is probably alien to my writing module. AVC: History deals partly with the Hounds, a clothing line that’s based on utility and authenticity. Do you think this speaks to a current need in our culture? WG: There’s something going on now—there’s a quest for the genuine. I find that really interesting. Marketing has pitched this genuineness for a very long time, and very, very seldom does it ever deliver. I find it interesting to see people—mostly people who are younger than I am—going to considerable trouble to try to reproduce things from an era that was far more physical, from a less virtual day. That fascinates me, because it seems to be symbolic of something going on in the culture itself, and I also have a sort of innate admiration for the stubbornness it requires to actually make those things physically. It’s become incredibly difficult. In North America, we’ve largely forgotten how to do it. There’s something going on there. I hope it’s not this nostalgia, because nostalgia, I invariably mistrust. It has too many downsides. But a yearning for things that somehow are real things… Some of these things people make become hyper-real. They’re making blue jeans now where the denim is four times thicker than any actual denim ever was before. It’s become counter-practical; like, you can’t sit down. AVC: You’ve talked elsewhere about the modern dilemma of separating the real from the virtual. How does something like Twitter confuse the issue? WG: More and more, I think the thing our descendants will find most quaint and old-fashioned about us is the trouble we still take to make that distinction, between the virtual and the “real.” I think that will seem sort of Victorian to them, because I think we’re already losing the need to make the distinction, and I don’t see that as necessarily a bad thing. That doesn’t fill me with the panic it fills some people with. The back-and-forth [of Twitter] is the same back-and-forth we’re having right now in a telephone conversation, and it’s very much like the back-and-forth that Victorian English people had with their three mail deliveries a day. Except that with a medium like Twitter, it’s simultaneously public, in large part. It becomes a communal activity. I don’t see it as a new activity, inherently. I think it’s something we’ve had equivalents of for forever, but the completely post-geographical way in which we’re able to do it is new. And it must be changing it somehow. I actually don’t think we can know what emergent technologies are doing to us while they’re doing it to us. In fact, I don’t think we know yet what broadcast television did to us, although it obviously did lots. I don’t think we’re far enough away from it yet to really get a handle on it. We get these things, I think they start changing us right away, we don’t notice we’re changing. Our perception of the whole thing shifts, and then we’re in the new way of doing things, and we take it for granted. AVC: Is that the reason behind your shift from futuristic science fiction to the more immediately modern work you do now? WG: I think it’s more because what’s happening now is the real-world version of what I was imagining in the early ’80s. For one thing, there’s not as clear a shift going on anymore. In the ’70s and ’80s, we were transitioning over to something really new, so that was an interesting time for me to go into full projective science-fiction mode, and build models of where we were going. Now we’re kind of there, but we’re not clearly transitioning into some next thing that will be as distinct from where we are today, as where we are today is from the ’70s and ’80s, if that makes any sense. If I woke up one day and saw something that indicated to me that we were clearly headed off to as big a shift as instantaneous global computing for everybody, I would sit down and write something about it. But today, it feels like a better use of my time to use the toolkit that science fiction issued me to examine a present that becomes increasingly fantastical and more peculiar with each passing day. Already, we’re living in a future that’s weirder than anybody except possibly [British science-fiction novelist] John Brunner ever imagined in science fiction. It’s like incredible multiplicity of complexity. We’re simultaneously running plotlines from about a dozen science-fiction movies. AVC: Do you still consider yourself a science-fiction writer? Does that term still have meaning? WG: Well, the culture is still there, and people are still doing it. I imagine some people are doing it very well indeed. As for me, it definitely was my native literary culture. Science fiction was where I’m from, but on the way to now, I went through a lot of other territory, and I wasn’t really that culturally conventional an SF writer when I started. I had a lot of issues with the genre, and I probably even had issues with the whole idea of genre. I was coming into it with a certain degree of outsider attitude, and I didn’t have a long-term plan. But I think the way it’s worked out, it’s sort of warped into what I suppose you could say is my own genre. If people like my books, they have some idea of what the next one will be like. AVC: You often feature strong female protagonists, which in science fiction is not always a given. WG: That was part of the attitude I had when I came to write science fiction. I had a list of things that science fiction, particularly American science fiction, to me seemed to do with tedious regularity. One was to not have strong female protagonists. One was to envision the future, whatever it was, as America. The list went on. So without issuing any manifestoes or anything, I just proceeded to write counter to those things at every opportunity. I can’t imagine writing a book without some strong female characters, unless that was a demand of the setting. I actually tend to suspect that in real life, there have always been very strong female characters, but at certain stages of society, they’ve been asked to cool it. AVC: The iPhone pops up often in History. Given the recent controversy over the iPhone 4’s lack of function as an actual phone, what do you think that has to say about the way the market defines our need for a product? WG: It’s not like I’ve given the iPhone pride of place in this novel because I think Mac is particularly cool. I’m giving it pride of place because it was able to become iconic, and also as a couple of characters note in the book, it’s iconic in a way that changes human gesture. The movements people go through when they’re interfacing with their iPhone are fundamentally new. That touch-screen thing, and holding it up to sort of look through it and do augmented-reality stuff, that’s something new. That’s actually the level at which my critical eye is attracted to technology when I’m in fiction-writing mode. These three books are set in—it’s not always entirely clear, but they’re actually set in the year in which they were mostly written. Zero History is actually taking place last June, and there aren’t any iPhone 4s, and if there were, my main characters, because of who they are, wouldn’t particularly care or even know about it. Mainly because it’s handy for me, because I’m not that technical guy myself. My protagonists lately have tended to be behind the curve. AVC: You’re famous for inventing terms like “cyberspace.” Now you’re using brand names and other people’s terms. Does it change the process to be using pre-existing slang? WG: It makes it much easier, because now the actual language of the street can drive the narratives, in a way it couldn’t before. What I had to do with a novel like Neuromancer was to invent the language of the street, then let it drive the narrative, and keep doing that all through the book, which is a whole extra level of work. If it had been a film, there would’ve been a separate neologism shop, where people are constantly coining slang technological terms and trying to make sure they at least felt consistent with the rest of the imaginary terms in the book. This more recent fiction set in some version of our present, I have a sort of embarrassment of riches when it comes to terminology and slang. AVC: Pattern Recognition was optioned for a film adaptation a few years ago. Has there been any movement on that? WG: Unfortunately, that eventually fell apart. In the way of these things, it’s debatable as to what caused it to fall apart. I seem to be in a very long phase in which these things aren’t actually viewed as being that filmable. As far as movies go, as far as these last three books go, I can see a miniseries much more easily. I can see television much more easily than I can see features, because the economy and politics of making big, big features seems to me to be narrowing even from what it was. Television has—particularly at the HBO level in the United States—become a completely new genre. Something like Deadwood or The Wire is a whole new thing—there was no equivalent to that medium before. It’s like a new way of telling stories. When I think about these books, they feel much more like that to me than if they were chopped down, the way you have to chop books that size down to an hour and a half or something [for a film]. It just wouldn’t be them. AVC: You characters wade through intellectual one-upsmanship and high concepts, but in the end, personal relationships matter the most. Do you think these connections are more important to us in the digital age? WG: I don’t know. In the real world, I don’t know. Some people have crucially important intimate relationships via the Internet, and some people have crucially important physical relationships and emotional relationships that wouldn’t have happened without the Internet. I have to think that what it is is that we’re doing all the stuff we did before in an increasing number of new arenas, that the shapes of these new arenas have potential to change these things we’ve always done, but they remain fundamentally the same. That’s completely intuitive; I can’t make a case for the reality of that intellectually. But intuitively, it feels the same. Like when I go back and read something from the 13th century, we were always doing this stuff. It’s just that the arenas were different, and the metaphors were different. It’s kind of comforting to me, because it makes me feel that in a way, we’re really not that clever. We like to tell ourselves that we’re changing the fundamental basis of everything right now, and this is a unique time, but maybe not, you know? That may just be hubris on our part, and we’re just finding new ways to do the things we’ve always done.